For the last few quarters, Micron has become the victim of industry- and geopolitical-related headwinds. The company's prospects should improve in the second half of 2019 as seasonality improves and fears of a trade war appear likely to abate. If Micron can mitigate the near-term damage and maintain profitability, this could improve the case for valuation expansion going forward. Micron's current risks include an escalation of the US-China trade dispute and its significant exposure to China as a revenue source. 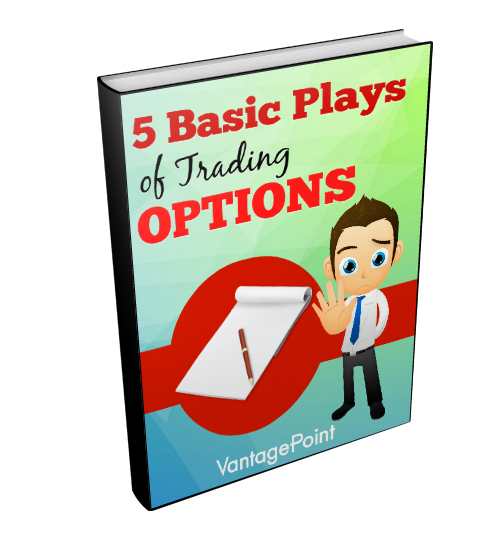 The stock is presenting a number of bullish technical signals that imply that the downtrend may be at an end. For investors in Micron Technology (MU), 2018 was essentially a tale of two halves, with the bullish sentiment initially experienced in the first half of the year eventually negated and overcome by a wave of uncertainty and downside volatility. 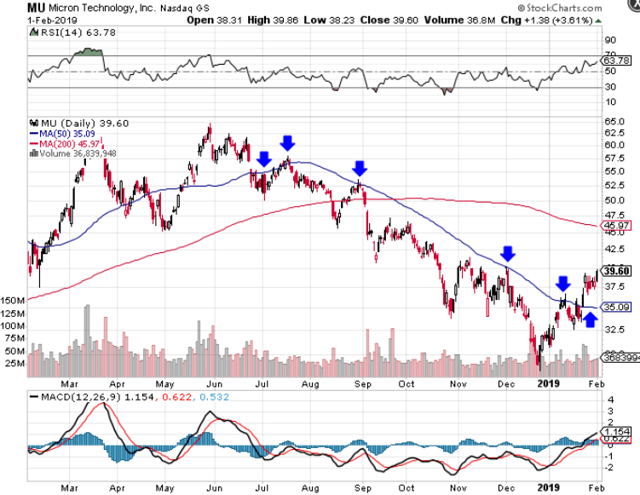 In this piece, I will discuss the causes behind the drop in MU since its peak in late May, why the company's prospects could improve in the second half of 2019, and some of the risks in investing in Micron's stock. I will also examine MU from a technical perspective, and point out how the divergence between the stock's fundamentals and technicals could mean that the worst is likely over. Due to how cyclical and commoditized the memory chip business is, Micron's stock movements are largely tied to factors like whether price points for DRAM and NAND are increasing or decreasing, supply and demand for Micron's chips, and the perceived direction of the memory chip industry. 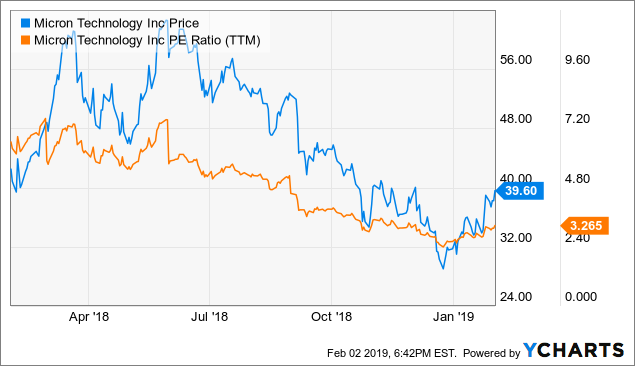 For the last few quarters, none of these factors have gone in Micron's favor, and the company has become a victim of weakening memory chip prices as well as weakness in the broader technology sector. 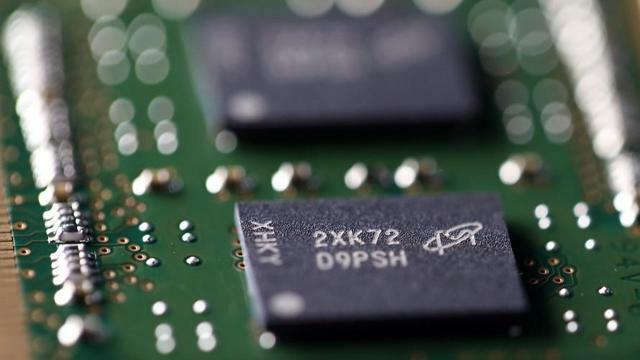 The outlook for memory chip prices in the near-term isn't looking rather bright either. For one, Samsung Electronics (OTC:SSNLF) recently announced a sharp decrease in fourth-quarter profits, along with a warning for weaker earnings in 2019. Samsung blamed the drop on a lack of demand in its memory business, and the poor results came amid already-lowered expectations for the company due to the weakness in semiconductors. 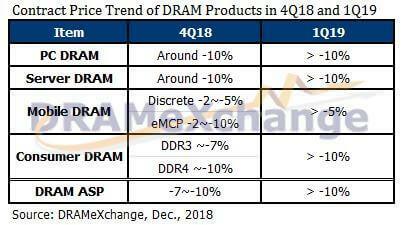 Additionally, both DRAM and NAND prices are projected to drop by around 10% in Q1 of 2019, according to DRAMeXchange. These price declines can largely be attributed to a combination of increased supply, high inventory levels, seasonal headwinds, and fears of an escalating trade war between the US and China. The depreciation in DRAM prices has been particularly worrying, as it comprised 68% of Micron's overall revenues as of the company's most recent quarter. Together, these negative trends appear to paint a bleak near-term picture for Micron and the memory chip industry. But as Baron Rothschild's famous quote goes, "The time to buy is when there's blood in the streets." 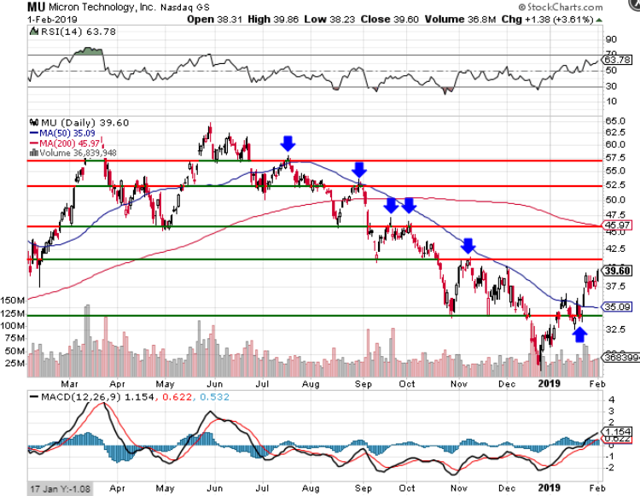 And in the following sections, I will highlight why there could be light at the end of the tunnel for Micron. Looking beyond fiscal Q3, as we enter the second half of calendar 2019, we expect a healthier demand environment alongside an improved industry supply picture, which should contribute to improved financial performance. We expect our own demand what we sell to our customers to pick up in the second half of calendar 2019, driven by in part these inventory issues being resolved in the current calendar quarter and next quarter. And also seasonal improvements in demand patterns, new product cycles, we'll have 5G phones coming out in mobile in 2019. So that will drive business as well. And longer term, we are extremely excited medium and longer term there are some really strong secular positive trends in the business. We have autonomous driving that's driving significant increases in DRAM and NAND consumption in automotive. Similar trends happening in industrial. We have very early innings of cloud growth taking shape. And we’ll have continued growth in the cloud business for many, many years to come. AI and machine learning are driving up demand for DRAM and NAND. We had spoken about many of those trends in past discussions. And also AR, VR type of technologies in 5G in mobile are going to be important product drivers with higher average capacities as well. Based on our customer discussions we continue to forecast year-over-year growth to resume in the second half of calendar 2019. Overall, Micron expects to see improvements in memory chip demand in the second half of 2019, driven by a combination of seasonality and increased demand for its chips. The company is expected to benefit from seasonal trends as smartphone demand picks up in the second half of the year, and the deployment and expansion of 5G is expected to serve as a significant demand boost as well. Additionally, the increasingly likely resolution of the trade dispute between the US and China would provide increased clarity for the company's customers and increase their willingness to continue purchases. What's also key to note is that the company's earnings don't have to bottom in order for the stock to: in the prior downturn, stock prices for memory-chip related companies bottomed four months before chip prices themselves. So considering Micron's assertion that memory chip prices are likely to bottom sometime within this half of the year, it wouldn't be unrealistic to say that the bottom for MU has already been put in. Micron has been well-known as the cheapest stock in the entire S&P 500 index, now trading at a P/E ratio of just over 3 and a PEG ratio of 0.13. The good news is, the stock's valuation doesn't present much of a barrier to the upside either, since it trades at such a cheap multiple. For example, if MU were to trade at Intel's (INTC) P/E of 11.02, it would have a price of roughly $133 and a market cap of $148.7 billion. Even if the stock were to return to its peak 2018 valuation of around 7.5 times earnings, it would be worth just over $90, representing ~128% upside from current levels. 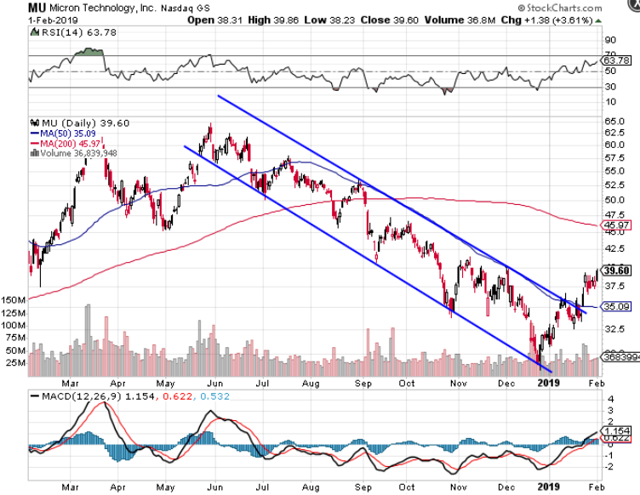 Even though earnings in 2019 are projected to decline Y/Y, I believe that the recent downturn can actually provide a valuable opportunity for Micron and its stock. 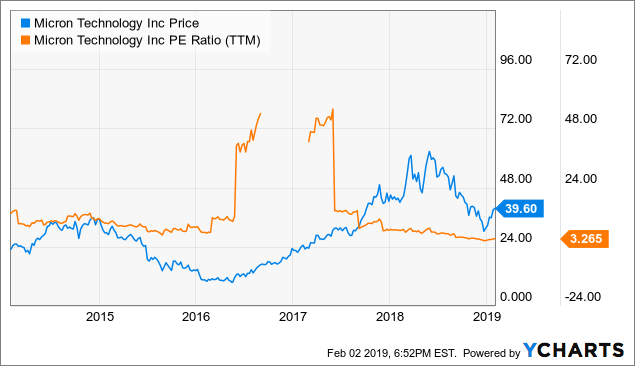 If Micron can maintain its profitability and make the case that the memory chip industry isn't as cyclical as it has been in past downturns, this would drastically improve the chances of longer-term valuation expansion in its stock. Such an expansion would be fueled by improving investor confidence in the company and its long-term growth prospects, which include emerging industries like 5G, AI, machine learning, and autonomous vehicles. While fears of an all-out trade war between the US and China are partially to blame for the declines seen in Micron's stock for much of the prior year, the tapering of these fears has served as a catalyst for the stock's post-Christmas rally. While there have yet to be any concrete developments out of the most recent trade discussions between the US and the Chinese, investors appear to be increasingly pricing in a positive outcome before the March 1st deadline, as evidenced by the strong magnitude of the rally in MU. If talks were to break down and the March 1st tariffs were to come into effect, such an outcome would very likely invalidate my bullish thesis on the company and its stock. An escalation of the trade dispute would be detrimental not only in terms of the added costs brought on by the tariffs, but also from the hindrance of investment in technology, which would hurt demand for Micron's chips. It seems more likely that both sides will come to an eventual agreement. An all-out trade war would likely represent economic suicide for both countries, and I doubt either of Trump or Xi would willingly push for such an outcome. However, this remains a risk to consider for Micron as long as an official agreement has yet to come into place. Earlier this week, shares of Nvidia Corporation (NVDA) tanked nearly 14% after the company lowered its Q4 revenue guidance, citing deteriorating macroeconomic conditions in China. The company stated that it expects quarterly revenues to come in at $2.2 billion, far below its previous guidance of $2.7 billion. With this announcement, Nvidia joined a growing list of American companies that have blamed revenue weakness on conditions in China, including Apple (AAPL), Caterpillar (CAT), and Intel, among others. Similarly to Nvidia, Micron also carries significant revenue exposure to China, with 51% of its revenues generated in the country. With the ongoing trade dispute contributing to declines in investment and consumer demand, it wouldn't be unreasonable to expect an especially weak quarter from Micron when it reports in March, or even to provide below-consensus guidance for the following quarter. However, a prolonged slowdown in China beyond the first half of 2019 would be deleterious for the stock, since it appears investors are currently willing to put up with near-term fundamental weakness in return for a turnaround in the second half of the year. 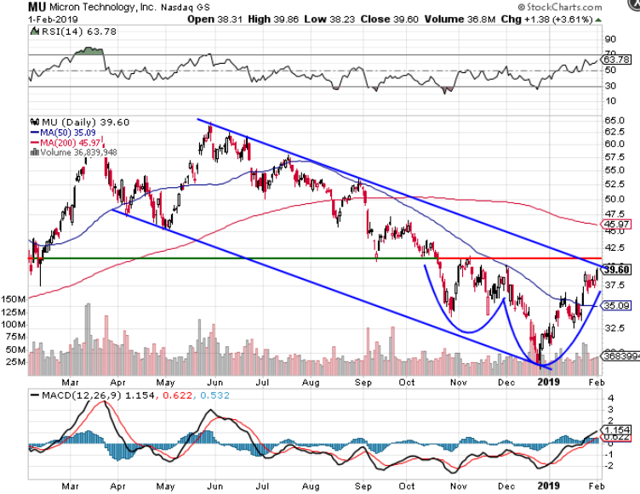 Provided the dispute can be resolved, conditions still appear likely to improve in the second half of 2019, when seasonal trends are expected to pick up and the balance of supply and demand starts to tip in Micron's favor. Considering how consistent a resistance level the 50-day moving average had been over the last several months, there is a high likelihood in my view that it will now convert to technical support in the event of a near-term pullback. Overall, the combination of these trends and indicators leads me to believe that the recent breakout has market the bottom for MU, as well as the start of a new uptrend. While Micron has found itself on the end of a number of industry-related headwinds, these fears have largely been priced into the stock, and there may be light at the end of the tunnel for the company as seasonal trends pick up in the second half of 2019 and geopolitical conditions appear likely to improve. The company's valuation has been a source of controversy for both bulls and bears, but the recent decline provides an opportunity for the company to improve its standing with investors, provided it can mitigate the near-term damage. And from a technical standpoint, I believe the growing accumulation of bullish trends and indicators in MU, most notably its decisive break above its 50-day moving average, marks the end of the stock's downtrend and provides a buying opportunity for long-term investors.